HOUSTON (AP) — George H.W. Bush, a World War II hero whose presidency soared with the coalition victory over Iraq in Kuwait, but then plummeted in the throes of a weak economy that led voters to turn him out of office after a single term, has died. He was 94. Bush, who also presided during the collapse of the Soviet Union and the final months of the Cold War, died late Friday night at his Houston home, said family spokesman Jim McGrath. Bush will be honored with a funeral at Washington’s National Cathedral, White House press secretary Sarah Sanders said Saturday. President Donald Trump and first lady Melania Trump will attend, she said. He lost his bid for re-election to Bill Clinton in a campaign in which businessman H. Ross Perot took almost 19 percent of the vote as an independent candidate. Still, he lived to see son George W. twice elected to the presidency — only the second father and son chief executives, following John Adams and John Quincy Adams. In the years after his presidency, George H.W. Bush came to be seen as a fundamentally decent and well-meaning leader who, though not a stirring orator or a visionary, was a steadfast humanitarian. Bush entered the White House in 1989 with a reputation as a man of indecision and indeterminate views. One newsmagazine suggested he was a “wimp,” but his work-hard, play-hard approach to the presidency won broad public approval. He held more news conferences in most months than Reagan did in most years. The Iraq crisis of 1990-91 brought out all the skills Bush had honed in a quarter-century of politics and public service. After Iraq invaded Kuwait in August 1990, Bush quickly began building an international military coalition that included other Arab states. After winning United Nations support and a green light from a reluctant Congress, Bush unleashed a punishing air war against Iraq and a five-day ground juggernaut that sent Iraqi forces reeling in disarray back to Baghdad. He basked in the biggest outpouring of patriotism and pride in America’s military since World War II, and his approval ratings soared to nearly 90 percent. After freeing Kuwait, he rejected suggestions that the U.S. carry the offensive to Baghdad, choosing to end the hostilities a mere 100 hours after the start of the ground offensive. The decisive military defeat did not lead to the regime’s downfall, as many in the administration had hoped. His legacy was dogged for years by doubts about the decision not to remove Saddam Hussein. The Iraqi leader was eventually ousted in 2003, in the war led by Bush’s son that was followed by a long, bloody insurgency. The elder Bush’s prime interest was foreign policy. Under his watch, the Berlin Wall came down, the Warsaw Pact disintegrated and the Soviet satellites fell out of orbit. Bush’s invasion of Panama in December 1989 was a military precursor of the Gulf War — a quick operation with a resoundingly superior American force. The troops seized dictator Manuel Noriega and brought him back to the United States in chains to stand trial on drug-trafficking charges. The other battles he fought as president, including a war on drugs and a crusade to make American children the best educated in the world, were not so decisively won. 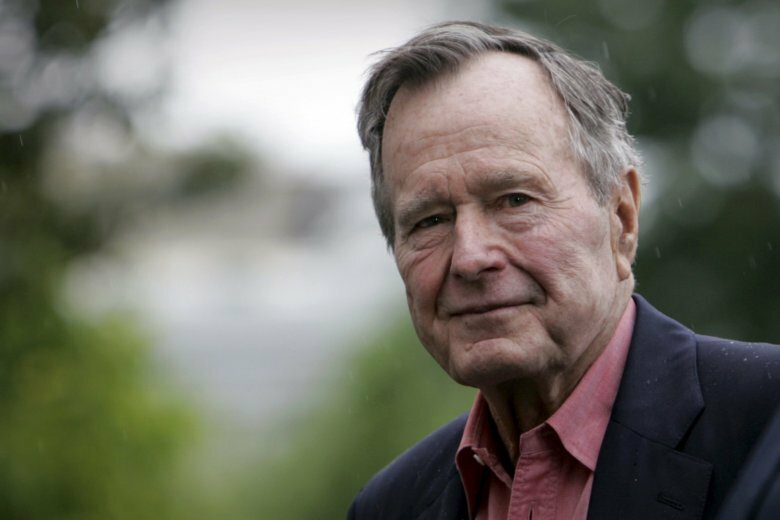 An avid outdoorsman, Bush sought to safeguard the environment and signed the first improvements to the Clean Air Act in more than a decade. He also signed the landmark Americans with Disabilities Act to ban workplace discrimination against people with disabilities and require improved access to public places and transportation. There were points of dissension. His nomination of a little-known federal appeals judge to the U.S. Supreme Court, Clarence Thomas, became a battle royal when Thomas was accused of sexual harassment by a former colleague, Anita Hill. His confirmation hearings, a national spectacle, sparking an intense debate over race, gender and the workplace. Thomas was eventually confirmed. Bush violated his no-new-taxes promise in the second year of his term, cutting a deficit-reduction deal that angered many congressional Republicans and contributed to GOP losses in the 1990 midterm elections. Then, seven years of economic growth ended in mid-1990, just as the Gulf crisis began to unfold. Bush insisted the recession would be “short and shallow,” and lawmakers did not even try to pass a jobs bill or other relief measures. George Herbert Walker Bush was born June 12, 1924, in Milton, Massachusetts. He was born into the New England elite, a world of prep schools, mansions and servants that was seemingly untouched by the Great Depression. His father, Prescott Bush, the son of an Ohio steel magnate, made his fortune as an investment banker and later served 10 years as a senator from Connecticut. George H.W. Bush enlisted in the Navy on his 18th birthday in 1942, right out of prep school. He returned home to marry his 19-year-old sweetheart, Barbara Pierce, daughter of the publisher of McCall’s magazine, in January 1945. They would be together for more than 70 years, becoming the longest-married presidential couple in U.S. history. She died on April 17, 2018. The couple had four sons — Neil, Marvin, the future president George W. and the presidential candidate and Florida governor Jeb — and two daughters, Dorothy and Robin, who died at age 3. After the war, Bush took just 2½ years to graduate from Yale, then headed west in 1948 to the oil fields of West Texas. Six years later, he moved to Houston and became active in the Republican Party. In politics, he showed the same commitment he had displayed in business. Bush was first elected to Congress in 1966, serving two terms, and went on to serve as ambassador to the United Nations, Republican national chairman through the worst of the Watergate scandal, envoy to China, CIA director and vice president. He made his first bid for president in 1980 and won the first contest, the Iowa caucuses. But Reagan went on to win the nomination. Bush had ridiculed Reagan’s tax cut plan as “voodoo economics,” but when Reagan failed to lure Gerald Ford as his running mate, he turned to Bush. In the 1988 presidential race, Bush and his running mate, Indiana Sen. Dan Quayle, trailed the Democratic nominee, Massachusetts Gov. Michael Dukakis, by as many as 17 points that summer. But Bush soon became an aggressor, flailing Dukakis as an out-of-touch liberal. He carried 40 states and achieved a nearly 7 million-vote plurality, becoming the first sitting vice president to be elected president since Martin Van Buren in 1836. He took office with the humility that was his hallmark. Graczyk retired from the AP in July 2018, after a 45-year career with the news service.